The Koolatron Coca-Cola Personal Cooler is the stylish and fun way to keep your drinks cold or warm. 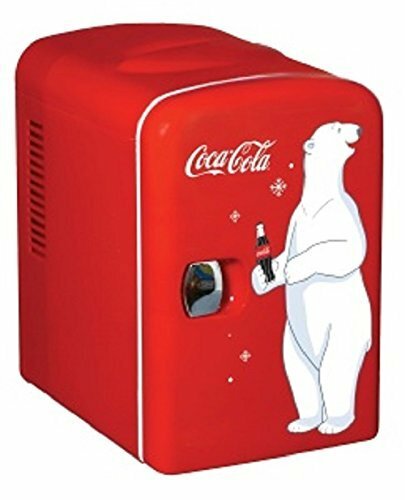 The Coca-Cola Personal Cooler looks like a small refrigerator and is perfect for the car, boat or home. State-of-the-art thermoelectric cooling technology allows the cooler to operate silently. The Koolatron Coca-Cola Personal Cooler holds up to six 12 oz. cans of your favorite beverage. If you have any questions about this product by Coca-Cola, contact us by completing and submitting the form below. If you are looking for a specif part number, please include it with your message. RCA Mini Compact Beverage Refrigerator, Yellow, Great for keeping office lunch and a couple drinks cool!